Does acronis drive monitor show icon tray notifications? I accidentally left a hdd on while I was asleep and it overheated a bit and generated problems, I was expecting acronis to show a notification of over heating, it did display a problem in the 'disks' when I hovered over the icon in the up arrow in system tray. I thought it would, but it didnt. Welcome to Acronis user forums! You may receive messages when a critical event/warning appears. Such messages will be sent when a problem occurs, and no new alerts will be sent until a system status is restored to OK, or a problem becomes more serious for the disk. This option is enabled by default. You may receive regular disk status reports with specified periodicity (see Regular reports schedule (p. 23 in the attached userguide) section for details). Acronis Drive Monitor also allows running monitoring process in the background. With the corresponding check box in the bottom of the page selected, scheduled tasks will continue running after you exit the program, e.g. when monitoring in the background is disabled, scheduled tasks will not run while the console is closed.This option is selected by default. 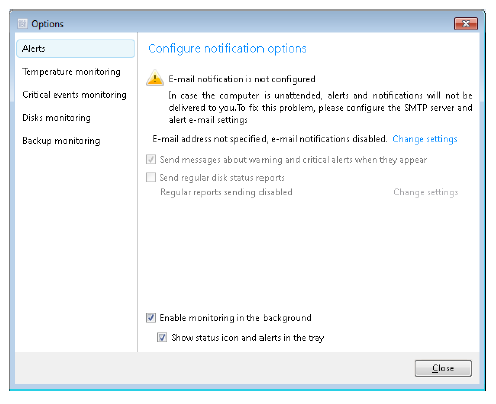 You can also specify whether you want a status icon to be shown in the tray while monitoring in the background (enabling this option is available only with Enable monitoring in the background selected). Information provided AS-IS with no warranty of any kind.